Underneath the lovely London sky, Harvey Nichols is having a Fizz, Bang, Poppins Christmas this year and the team at Ice have been on-hand with armfuls of Disney magic dust (and cherry blossom petals) to make the transformation a reality. 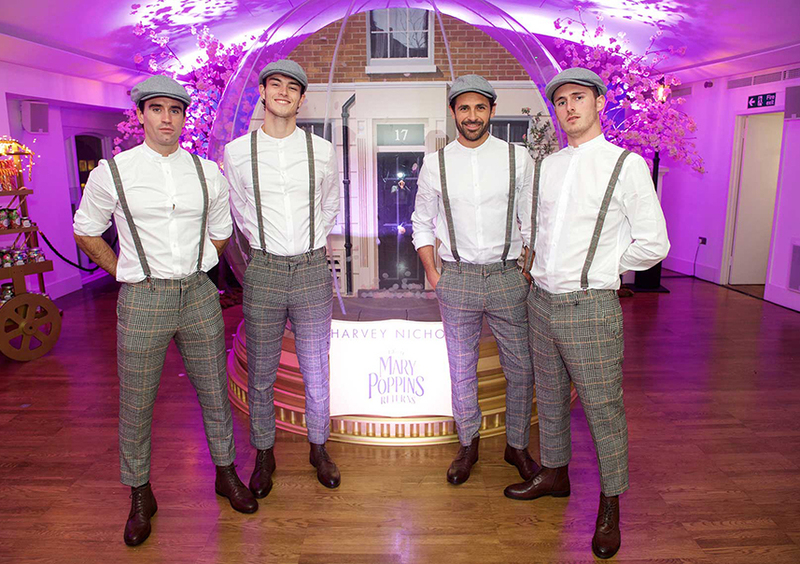 For the next charming chapter of the Mary Poppins story, luxury London retailer; Harvey Nichols briefed Ice to reimagine the bespoke fifth floor event space; Canvas, into a Mary Poppins themed wonderland. So beyond the chimney tops of the London Knightsbridge store, the Ice team have been hard at work recreating the magic from the motion picture; Mary Poppins Returns. With gold bedecked carts brimming with Christmas treats, a floral archway of cherry blossom trees, embellished bandstand and menus in the shape of soaring kites, Mary Poppins has well and truly arrived for the festive season. The centrepiece of this Poppins extravaganza is a giant gilded snow globe gracing the London stage bringing 1930s London to life. With a fizz, bang and a pop, guests can step onto the streets of London right through the front door of the Banks family home at 17 Cherry Tree Lane in this luxury photobooth. This fantastic photo experience is then captured in a swirl of cherry blossom petals as a printed keepsake and digital memory that can be shared with all of the family so that they too can enjoy the magic of Mary. Our Ice chim’ny sweeps have been paving the way for guests to enjoy this supercalifragilisticexpialidocious spectacle since the early November press launch amidst blooming bicycle baskets, a bandstand of live music and the larger-than-life experiential snow globe in celebration of the much anticipated film. Flat caps at the ready, our Ice elves will continue to bring the Disney magic into the New Year at Harvey Nichols. The premiere is set to take centre stage this week and the Knightsbridge retailer will be in full Mary-mode. With canopies of silver and gold embellished umbrellas, costumes from the set adorning the shop windows and live music instore on Thursday and Friday in celebration of the film début. So step aboard the Ice fairground carousel at Harvey Nichols for the magic of Mary Poppins Returns, with a Fizz, Bang and a Poppins this Christmas. The Mary Poppins Returns snow globe photo experience is open until the 4th January 2019.
Who put the 3 in The O3? © 2019 Ice (London) Ltd. - All Rights Reserved. Ice (London) Ltd - Events, Interiors, Exhibitions, Brand ID and Graphics.